Here is the entire bubble after it has been washed and ironed. Its amazing what soap and water will do. 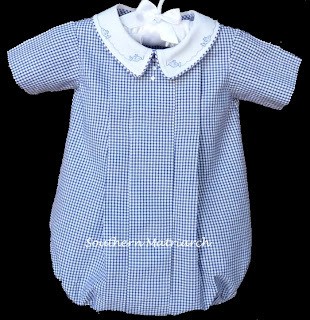 I have no idea where I got this navy blue gingham seersucker. But I have used it a couple of times now. Really like. It is a substantial fabric. Teeny sequin buttons from Old Fashioned Baby. 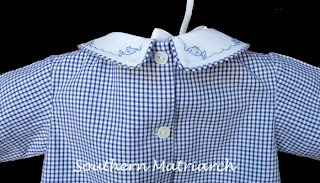 I used square mother of pearl buttons from Bessie Mary. I thought they looked "manly." Not sure why the collar looks askew. Again camera operator skills. And in answer to the comments about the collar post, I will have to take more pictures on the next daygown. I kind of had a brain lapse and thought I was done answering the question. Obviously not! I can tell you what the next steps were, but as you can see the rest of the steps have been completed. Having left off with basting the bias band onto the collar stack in the "Attaching a collar with a bias band" post, I stitched on the 5/8" seam line. Bumped my needle over to the right 1/8" inch, stitched a second time. Remove those hand basting threads. I trimmed the remaining seam allowance right up next to that second stitching. 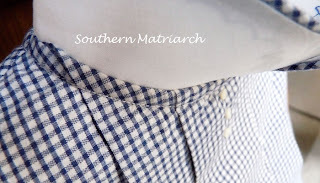 This is the same method I used in constructing the collar pieces themselves. After stitching on the collar, trimming the seam allowance, I understitched the bias band to keep it from rolling to the outside. The stitching line closest to the collar is my understitching line. I then turned under my raw edge, using my edge joining foot again, I machine stitched the bias down to the romper fabric since there is a collar that will cover that stitching all the way around. This shows the collar flipped up and that line of stitching used to stitch down the bias band to the underside. If there was not a full collar I would have stitched down the bias band by hand. A daygown from a new fabric I was asked to review. Spechler-Vogel's Skip Dent available at Bessie Mary. I am not 100% sure I will use the eyelet around the collar or the satin piping. I am kind of leaning towards the satin piping. I love baby girls in blue, but Mommy wants to pink things up. So I think I am leaning towards the pink piping and some featherstitching and bullions in pink. I am liking the fabric so far, it washes like a dream and retains a very nice cotton feel even though it is a poly cotton blend. And very affordable. Only a tad more in price than Imperial Batiste. 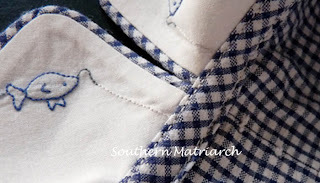 I have traced out a sweet white collar that will be very fresh against the pale blue. And a matching hanger of course. I absolutely love this bubble suit for a little boy! So, so cute. I can't wait to see your daygown! Ok, I think that is just about the cutest boy bubble I have ever seen! I just LOVE it! Thanks for sharing! 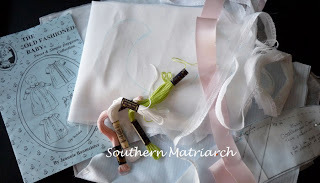 I can't wait to see the daygown you are making! Here is where I come to be inspired - every day - sometimes more - just to gaze at your newest creation. Thanks for giving us the behind-the-scenes help too. That is one sweet outfit. 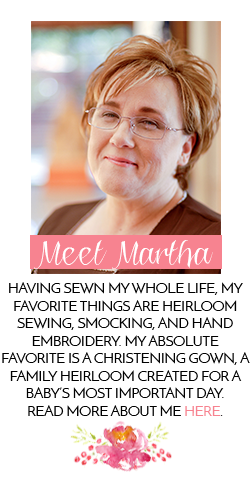 You are a treasure trove of great tips & information, Martha! Your attention to detail & the wonderful photographs that you share are a big help to those of us who struggle to improve our sewing skills. I can imagine a little pink bundle...powdered up...the scent mixed with the feel of the seersucker...ah...youth! Just precious! Beautiful! How I love to look at your work.